Ross Barnett Reservoir: Constable killed on the Gold Coast. 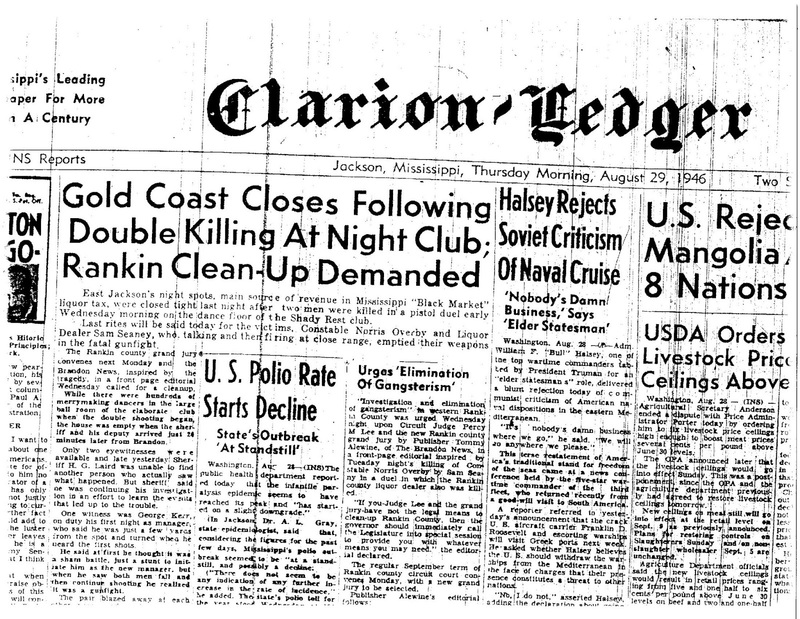 Jacksonians were shocked to read in the newspapers on August 29, 1946 that a Rankin County constable was killed at a Gold Coast nightclub. 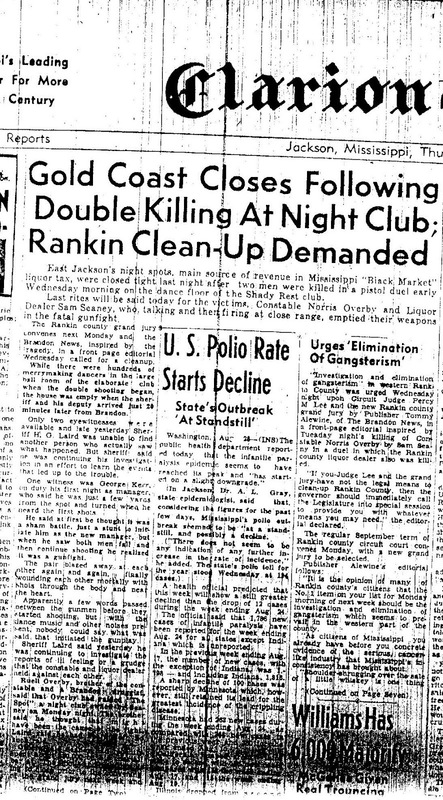 Constable Norris Overby and Gold Coast boss Sam Searney commenced to arguin' and yellin' and next thing you know, they were shooting each other. Both men fell down to the ground wounded and continued to lie on the floor. They reaimed their pistols at each other and commenced to shooting again until each one killed the other. 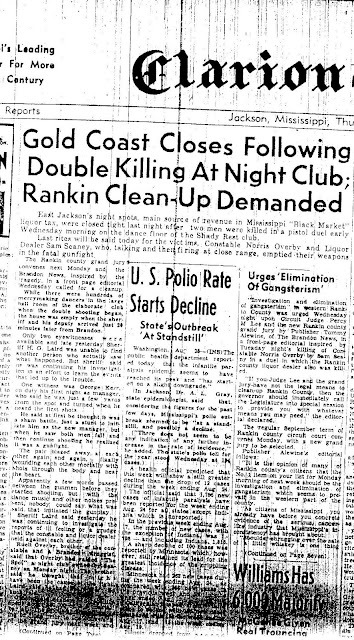 This event led to a massive but short-lived effort to clean up the Gold Coast. There were allegations that Overby was on the take and was demanding more protection money as he took bottles of liquor at will. 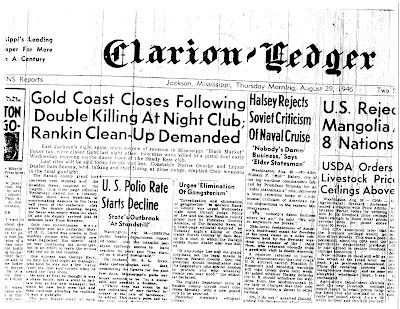 Few witnesses stepped forward to say anything as a bout of collective amnesia afflicted those who were present that night. Rackets are rackets but there is one cardinal rule as exemplified in <i>The Godfather</i>: when a cop is killed, the heat comes out regardless of how dirty the cop was. The Gold Coast survived and flourished for another twenty years as this episode was just that- an episode. These days there's not a lot that can shock people anymore. But we have to remember that a murder of a policeman or even petty theft at a storage facility isn't something that we should belittle.